Farmland views on the Wiltshire/Hampshire border. 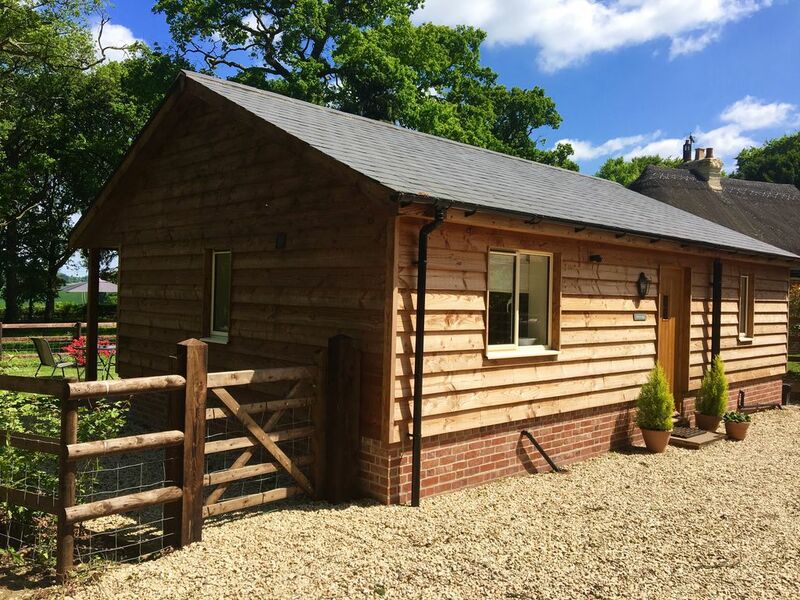 Owls Lodge has been built within the farmhouse garden, and is a superbly finished holiday home for two. Completed in 2016 to a high standard. The Lodge is furnished in a stylish, contemporary way with relaxation in mind. Situated down a short gravel track along the Clarendon Way we are perfectly positioned for long walks or cycling. Low clearance vehicles should drive with care. Please see main advert for full details of accommodation. A rural idyllic location. The gravel track leading to the property makes our Owls Lodge a quiet secluded place to stay. Shower room, incorporating an oversized shower. Connecting to the router in the main house, wi-fi is available in the Lodge. Open plan living area with TV/DVD and freeview. Large sofa-bed for additional guests/children. Please enquire as to additional charge as prices are based on two sharing. Newly fitted kitchen, with intergrated washing machine, microwave and a large fridge/freezer. Ample storage space for groceries and a solid wood breakfast bar with two stools. Private secure garden, mainly laid to lawn with post/rail and stock fencing. to the rear of the property, with views over open farmland. Due to our rural location mobile phone service can be intermittent. Enjoy the peace and tranquility! Lovely little lodge, everything you need plus wonderful setting. Would 100% recommend for a peaceful getaway! A beautiful, quiet and well thought out place in what feels like the middle of nowhere. The Lodge itself is compact but well furnished, very warm and comfortable. It is perfect for two! Thank you for coming to stay again, and of course your brilliant review! So glad you had a super time. Absolutely lovely little place, so peaceful and quiet, birds sing in the morning and owls hoot at night. Such a great place to escape and get away from city life. Hayley was very accommodating to us and the place was so homely and spotless! Went for a 3 hour walk whilst there, the area is stunning. Cannot fault a thing, will definitely becoming back! Thank you Kenzie for your brilliant review. So glad you had a lovely time, I’d welcome you all back in a flash! The lodge is perfectly appointed with plenty of space for two; Hayley has thought of everything! The location is secluded, if you want peace and quiet, this is the place..
We ate at the Lord Nelson pub and the food was excellent. Wonderful location and beautiful property! Thank you. The title says it all - a peaceful retreat! The Owl's lodge is a warm and cozy little house perfect to spend a couple of days - or more! - away from any kind of stress. Set in the countryside and true that the access might seem challenging - a steep, uneven gravel path - once you're there the house is equipped with everything necessary. The lodge is surrounded in woods so a walk around is a must! And at night, one can even hear the owls that give name to the property. Thanks Hayley for keeping this accomodation so well mantained and decorated, what a discovery! The medieval Cathedral City of Salisbury is approximately 8 miles to the east of Winterslow. The equally inviting towns of Stockbridge, Lymington, Poole, Bournemouth, Winchester and the stunning New Forest National Park are all within a 45 min car journey. We are also a short car journey away from Stonehenge. Owls Lodge is sat along the Clarendon Way, the old roman road between Salisbury and Winchester. A 26.2 mile walk jog or run for those of you feeling energetic! Bentley Woods is nearby (10 minute walk) with some 1700 acres of woodland to explore. A site of special scientific interest, a nationally renowned haven for rare butterflies, with an abundance of wildlife.